Virusdie antivirus module is now available for purchase and installation from the ISPmanager control panel. It scans for the malicious files (trojans, rootkits) and tracks the code injected into regular PHP/JS scripts. If the antivirus finds a suspicious code but cannot determine whether it is a virus or not, it will notify you in the report without deleting a potentially infected file. You can set up automatic cleaning of the infected code or manually delete the marked files and highlighted parts of code to your liking. You can initiate a scan automatically or by hand, separately for each user or all of them at once. Grant settings access to specific users and schedule automatic scans to a convenient time. 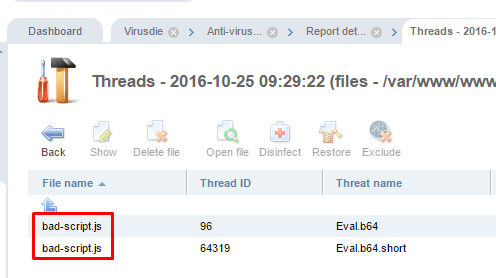 New viruses are discovered daily, thus automatic scanning is preferred: Virusdie drastically shortens the time you spend looking for the server threats, and most viruses will be removed automatically. Virusdie module is available straight from the ISPmanager control panel, which is free to all the ISPserver hosting services users.